I have enjoyed a very relaxing two week (approximate) vacation from running Starry Girl by Starzyia but I was very excited and glad to reopen my online stores and am preparing for Valentine’s Day amongst other seasonal and themed occasions for 2013. 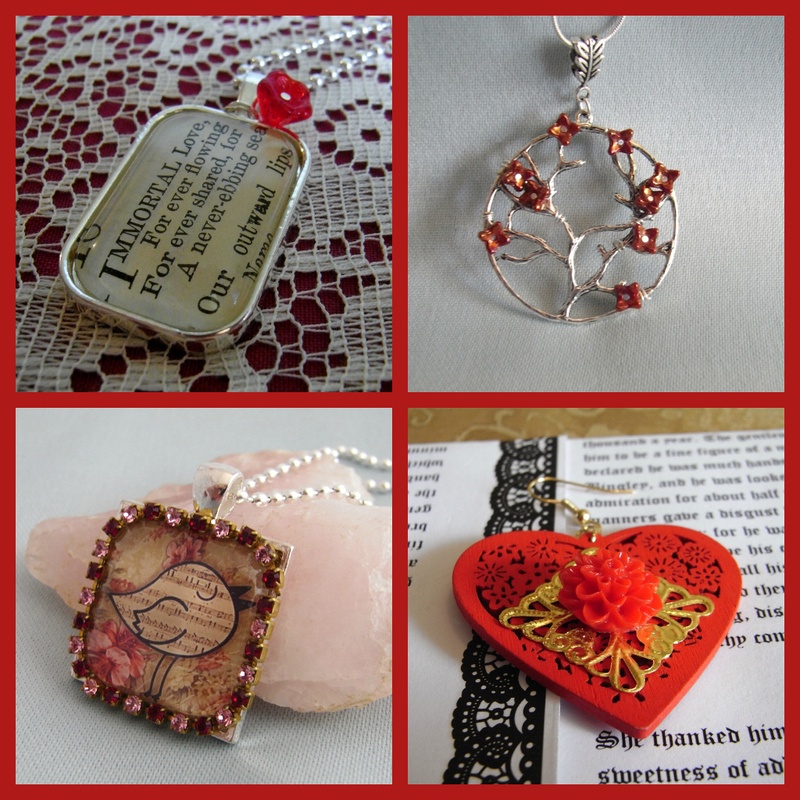 I’m sharing some of my favourite creations for Valentine’s Day now, because I know many of my friends and loyal supporters are spread across the globe and need time for items to ship, plus I have been planning and saving these items especially and I can’t wait any more! 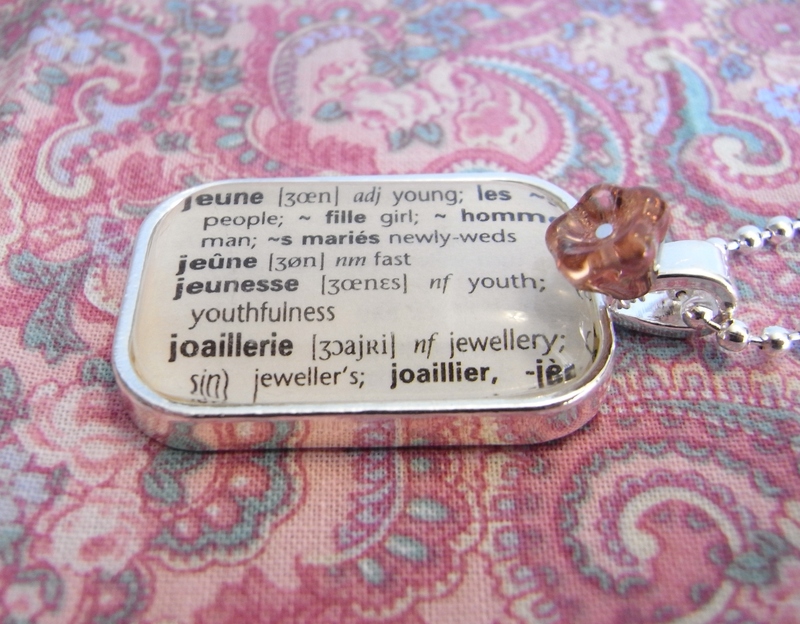 The Ardent Love pendant is beyond a doubt my favourite, I have used the original vintage French-English dictionary page showing the words “Ardemment, fervently, amour ardent, ardeur” a great way to express passion and strong love to someone special in a way that is trei chic! 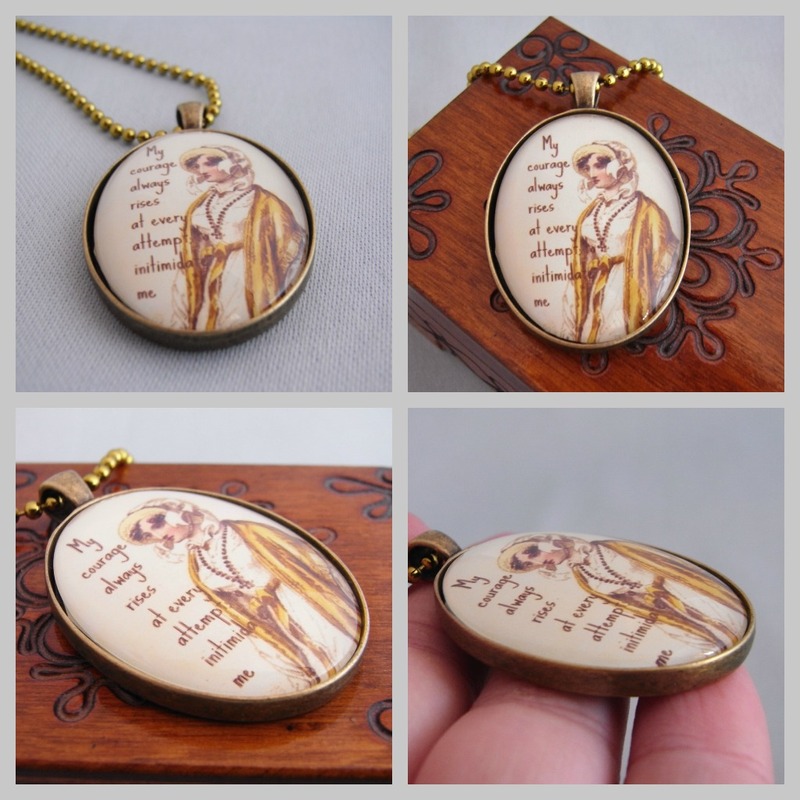 Another new etsy offering is the Immortal Love pendant which is made with the original page from a vintage 1933 hymnal, though it is a hymn, it reads like a love poem “Immortal Love, forever flowing, forever shared, a never ebbing sea, our outward lips name” which is right up there with the beautiful, passionate Song of Solomon. 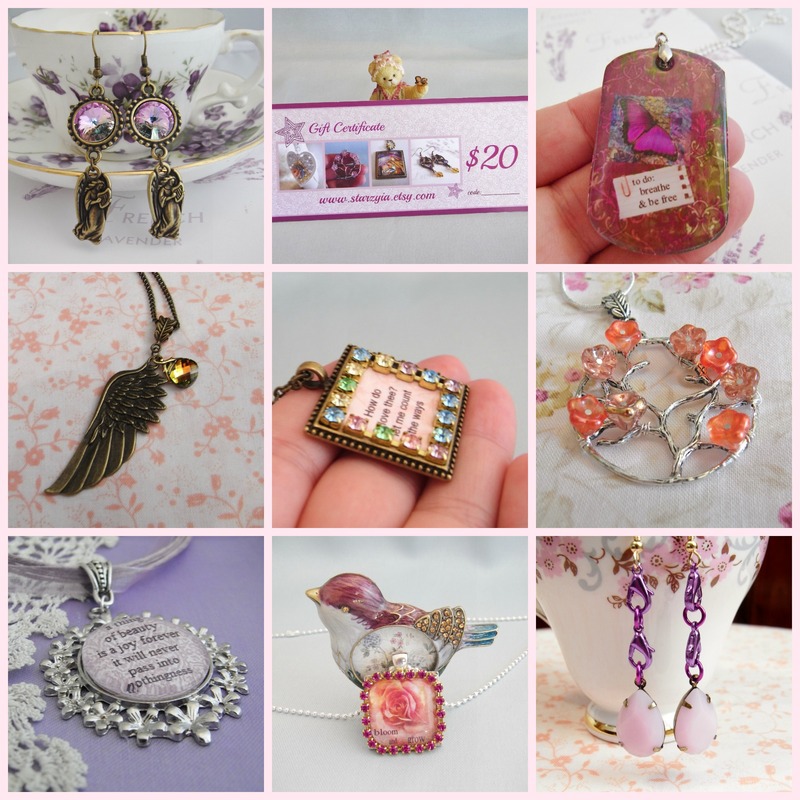 The Ruby Songbird is a great shabby chic pendant with a symbolic singing bird (love, happiness, contentment) and is a deluxe edition with sparkling rhinestone border in ruby/garnet and pink rose. 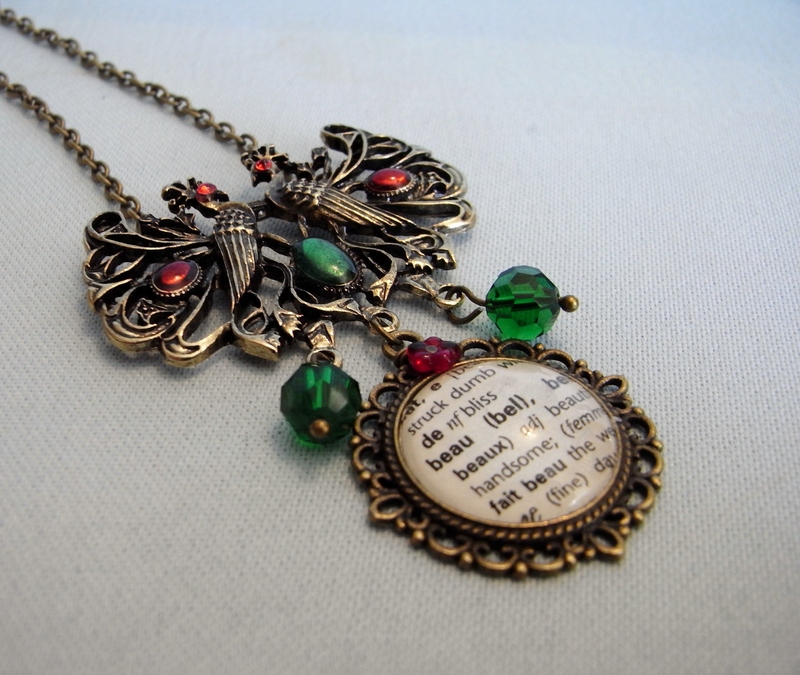 This would also make a great gift for a singer, and the paper bird has a sheet music motif. The Red Hot Love earrings (gee, I wonder why I named them?) are the red laser cut wood earrings with golden filigree and red rose cabochons, though large these are nice and light weight, ear friendly design. 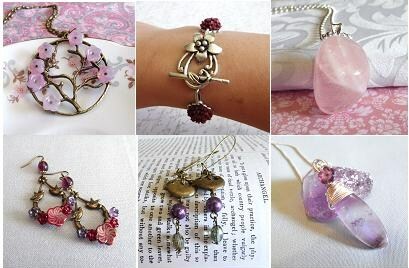 These are offered through my madeit store along with some similar designs in a pale pink heart, honeysuckle pink heart, and a lovely shabby chic white heart. I’m also working on some patriotic, Australian offerings for Australia Day (January 26th), back to school (which it is time for here very soon), Easter, and later Mother’s Day and change of seasons means a change of colours and textures. There will soon be a return to my special feature interview type posts showcasing some worthy and truly fascinating handmade artisans I’ve met along my handmade journey, and symbolic gift guides once I get back into the swing of things this year. For those of you who started to follow the blog during the Starzyia Daily Photography Challenge last year, I will be running another one in February so feel free to join in, I’ll let you know how when the time is nearer. I’m hoping to stay true to my heart but make this blog better than ever and I hope you will always feel free to join in, comment, and share the journey. Wishing you the most amazing, inspiring, happy, healthy 2013! I’m holding my very first live online market event through my Starzyia facebook page. 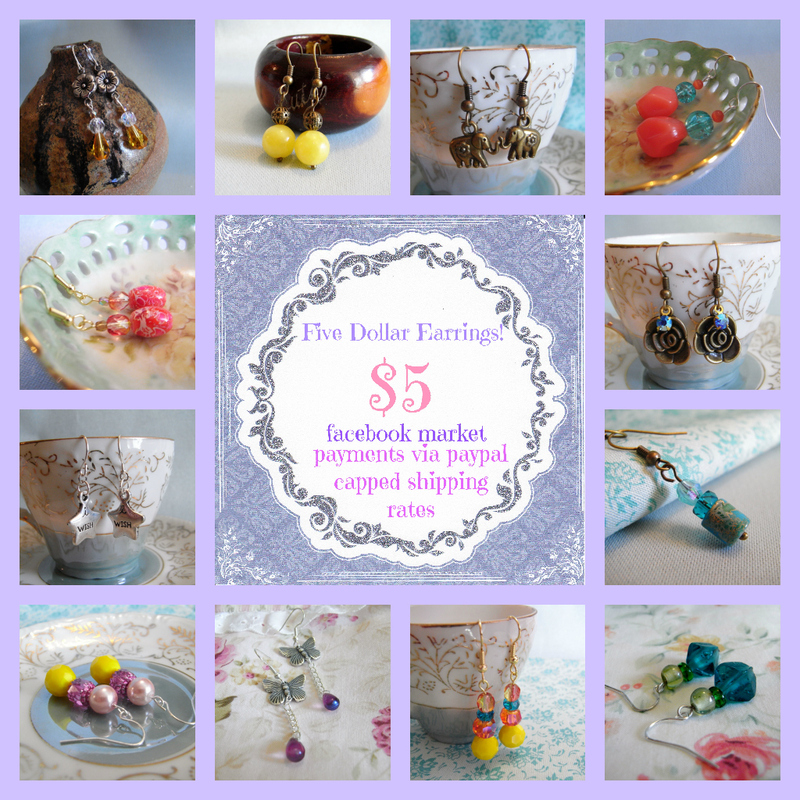 This is a $5 Earring Market, everything in the album can be purchased for $5 plus an economic, capped shipping fee of $2 for Australian domestic orders and $5 for all international parcels. 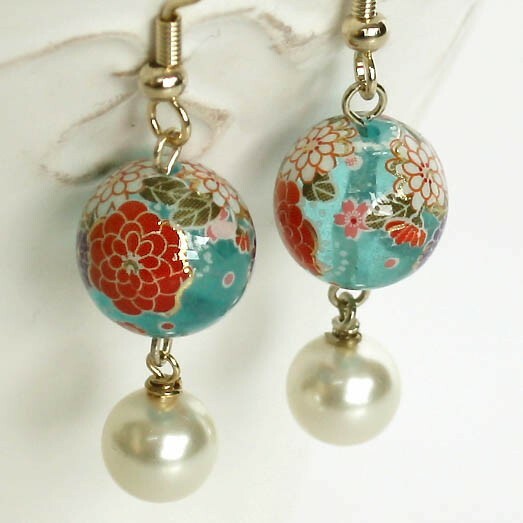 All earrings have been handmade by me and are lead and nickel free. Payments will be handled via paypal invoice, this means you get protection not only of keeping your financial details private, but of the paypal complaints resolution – meaning you have my word you will receive your goods and they will be in mint condition. 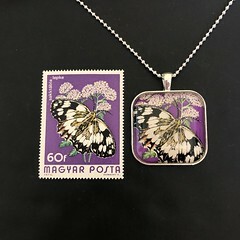 There are almost 30 different designs which you can view in the market album, the first person to comment ‘sold’ under each design is the buyer, and therefore you must only comment ‘sold’ if you are committed to receiving and honouring a paypal invoice from Starzyia within 3 days of the close of the market. I had so much fun working on this market that I really hope it will be successful, I’d like to hold a $10 market in two weeks time and perhaps some more closer to Christmas. 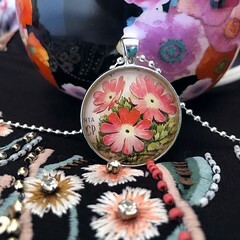 To celebrate my new in-studio designed Jane Austen jewellery, and to help launch my once a month newsletter, I am going to give away the pendant above to one lucky subscriber. My newsletter is free and only comes once a month, it is a chance to see how I am growing, my hopes and dreams for the future, a behind the scenes look at the Starzyia studio and my life and world around me. There will also be forewarning of major sales events or giveaways, giveaways for subscribers only, and more! 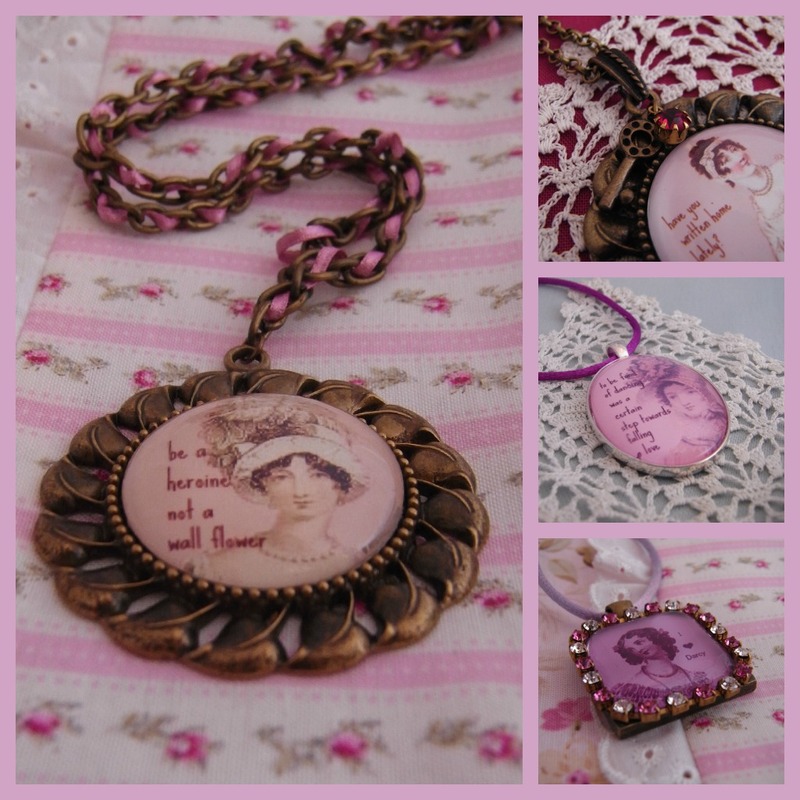 The prize pendant is a quote from Elizabeth Bennet of Jane Austen’s ‘Pride & Prejudice’ and reads “My courage always rises at every attempt to intimidate me”, it comes on its own chain and I will ship it for free in its own special Jane Austen wrapping envelope that I designed for my range. To sign up for my newsletter click here. If you are already a subscriber you will automatically be part of the draw which is held on October 1st 2012 using an online randomiser. All subscribers on October 1st will be in the draw. The winner will be announced in my October newsletter which is sent via email the first week of October. 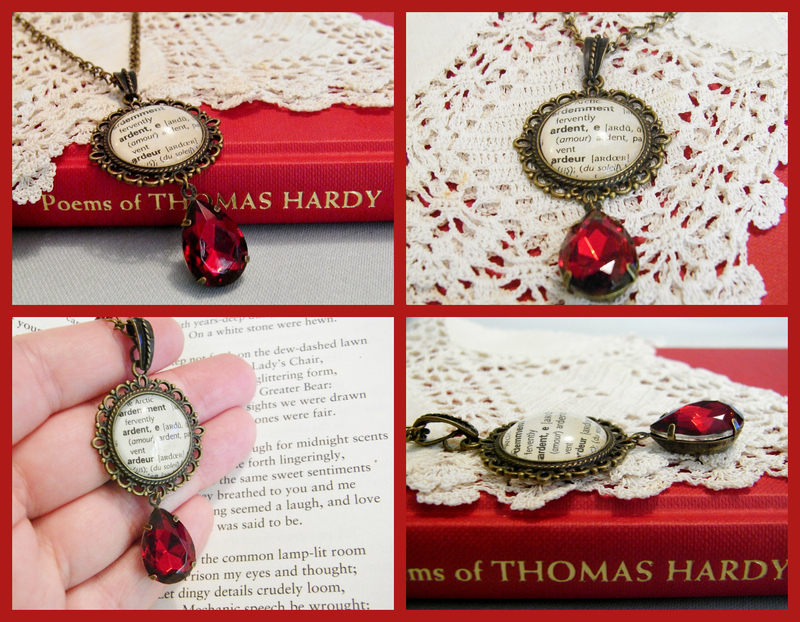 I am also excited to add upcycled vintage French-English dictionary pendants to my collection of upcycled hymn book and bible quotation jewellery in my etsy store. 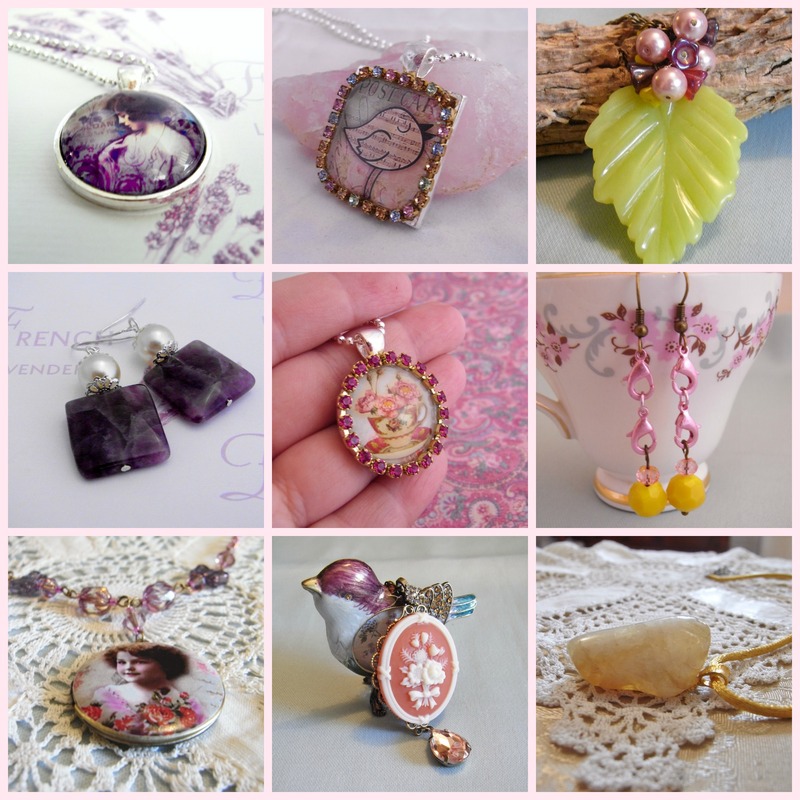 These have been so wonderful to create, they give me such a happy feeling as I work on them, I hope you can see why! Belle & Beaux Peacock pendant was the very first design from this range that I added to my etsy store, it features the French and English words ‘bliss, bel, belle, beauty, handsome, beaux’ and would make a great, romantic gift or just something very special for a collector. 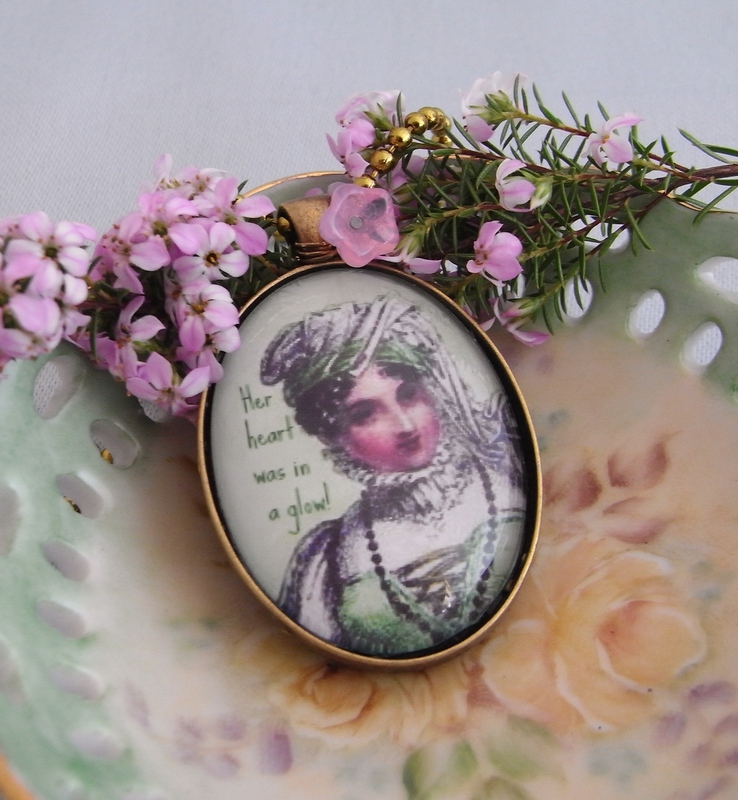 Hopefully I will continue to find plenty of vintage sources to upcycle for you and I will be creating new themed altered art collections too, I just had to start with Jane! being spring here and I’m overdue to re-read my favourites, lol. Its been a mostly very fine and sunny winter – translation no cloud cover at night makes the night and mornings very chilly! Of course it has been quite wet all at once too, mostly when I have to walk the dog. Yep, Fizzy doesn’t just run himself silly in the backyard, he and I both need a real brisk walk each day (sometimes two), and we love to go down by the river. With some early signs of spring, I am almost ready to pass the fall-winter baton on to my northern hemisphere friends, and I’ll be glad to receive your spring-summer baton but without the heat waves please! 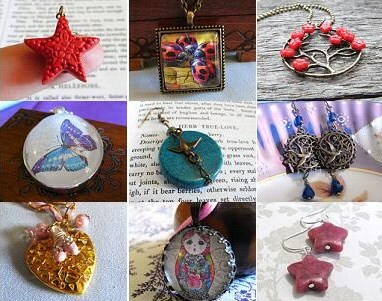 Starzyia on Etsy, My Anniversary! A special tribute to the people who have helped me along the way…. The first person I have to thank is Jace Yong, a beautiful and generous online friend I met via blog. Jace was the first person I ‘knew’ who had their own etsy store, and when I started I decided the most useful question I could ask, as the first few days passed without a sale, was how long she waited before she got her first sale. I thought I needed to put my expectations into perspective and learn what might be regarded as normal. Not only did I get an answer that helped relax my anxieties, but it turned out that before long had passed Jace became my first customer, buying two sets of gift tags (in those days I did offer a lot of cards, gift boxes, and tags). Jace also told me how useful being part of the Malaysian based etsy team had been for her and gave me the direct link to apply to become a member of DUST the Down Under Street Team, the very strong and wonderful Australian etsy team that has been an incredible source of support, information, and inspiration as well as friendship. The DUST community has been incredible, any time I need advice the team chat and forum has been my first port of call. Through DUST I have had advice on resizing my early product photographs, improving my photography, my first crash course in SEO (thanks Ny), and a miriad of other business and promotional related questions the answers to which have helped keep the roof over my head. The next big thank you goes to Gwen from Raintree Atelier. I ‘met’ Gwen after featuring some of her beautifully handmade earrings on the blog I had at that time, I even said that she makes the kind of jewelry I wish I made. Back then, I was making whatever I possibly could using my very limited range of local suppliers… the jewelry that resulted from those efforts in no way resembled my own personal style, which is a lot more like Gwen’s beautiful and graceful creations. I was a little bit in awe… I wanted to transition from my very over the top, bold, and out of control designs to a more elegant and timeless look. I needed not only to alter my designs and learn additional skills, but I desperately needed to expand my list of suppliers and improve my photography so that I could present my jewelry as nicely as the wares on display in my favourite etsy stores. Gwen tried her very best to give me photo advice but it was not until I got my current camera that I was able to really utilise her tips, but I remembered everything she had recommended, and when the time was right, I think I achieved it. Cheers to a wonderful role model and friend! 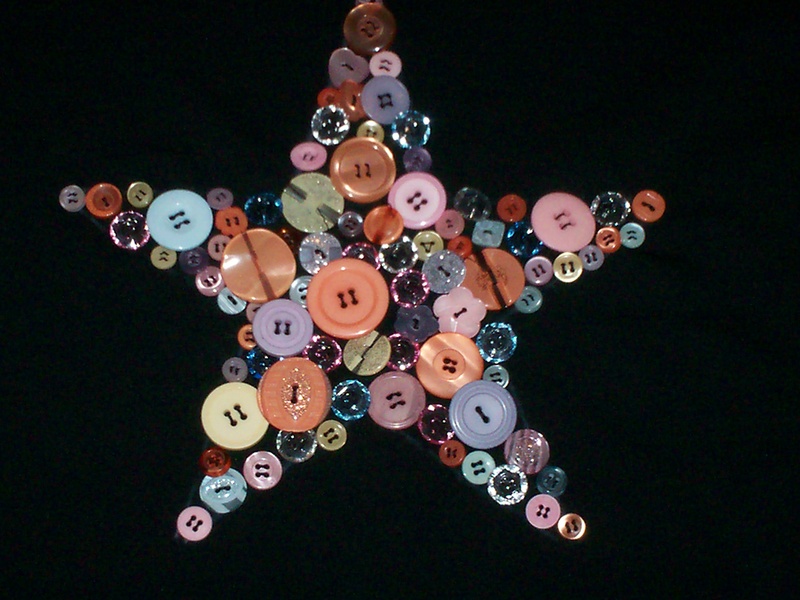 My next thank you goes to a wonderful Australian etsian and DUST member Liz, from Hundreds of Buttons she probably does not remember this, but she was the first person to feature one of my creations in a treasury list. I was thrilled! 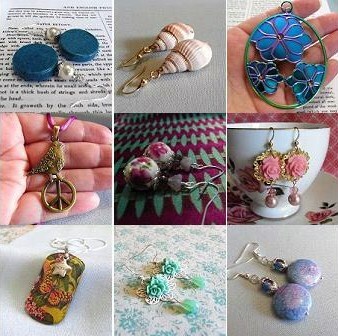 That first year in business I think I sold 3 items (I was not producing the kind of jewelry I do now, and I was not working to promote the store or maximise my reach) so it was a very encouraging milestone to be included in my first treasury. Thank you Liz, you actually gave me hope in a bleak time and I have never forgotten! Actually, as I said, I sold 3 items that first year, and this shirt is still available, haha! I think most people who liked it figured they’d just make one themselves! But if you’re interested…. let me know. My anniversary thanks would not be complete without acknowledging my two greatest customers who between them have collected quite a few pieces of my work, Diane and Joanne, I love you two very much and I have always found your support and encouragement comes along right when I need it most. One of the most remarkable things to me is that you both bought jewelry from me in my early days when my pictures were blurry, washed out, or otherwise unprofessional, it warms my heart that you could see beyond the photograph to the merits of the jewelry itself and that you supported me when you could easily have shopped elsewhere. 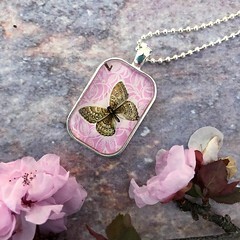 Now I am excited not only to create my jewelry but to arrange the photo shoots for all my products and to know that as I have grown, I have had my loyal friends and customers come along with me on my journey. Thank you! On my 3 year journey, I have met so many people I cannot possibly thank all here by name, but I promise you that I remember the kind words, the encouragement, the generosity, the lovely customers, the people who have featured or promoted me (especially Samara from Maddabling; Jess from Full Spiral; and Zenobia Southcombe). 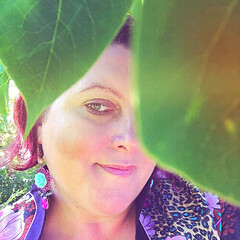 I know who it is that buys my work, and I also know who supports me tirelessly by sharing my work and my page, clicking, liking, linking, commenting and inspiring me… everyone who is there when I need them, and who has helped me make it to April 13th 2012, my 3rd Etsy Anniversary, thank you. You mean the world to me. My etsy store is the flag ship of my business and offers the widest range of my work, and has to balance offering items for both the northern and southern hemisphere seasons. In this store you can also select gift certificates that are sent to your inbox in under 24 hours, these look lovely printed out or can be forwarded to the recipient’s email address. My madeit store is usually stocked with items that reflect the current season in Australia, though most jewelry is created to look good year round for a lifetime. Thanks for your interest and support, I have been enjoying shipping my parcels to buyers around the world, and I also appreciate the help of my loyal followers who share, click, like, forward, praise, and otherwise spread the word about what I have been doing. You are the reason I will be enjoying my third anniversary in April 2012.